Poke holes in cooled cake with wooden dowel or end of wooden spoon. 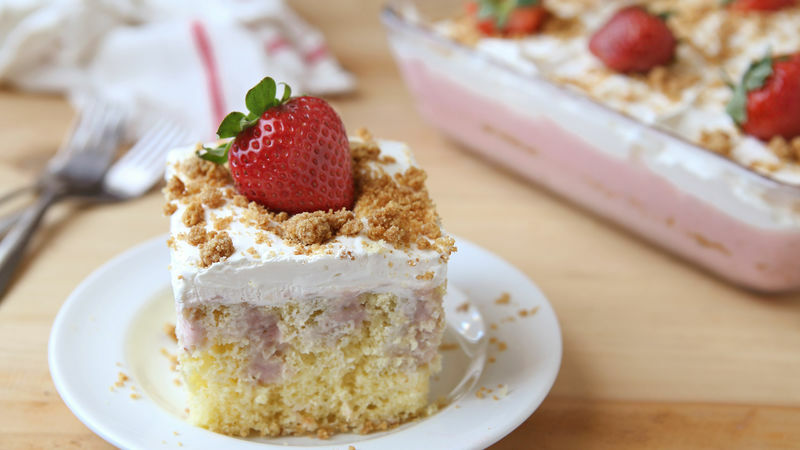 Pour strawberry mixture over cake, using spatula to encourage it down into holes in cake. Refrigerate 3 hours. Heat oven to 350°F. In small bowl, mix graham cracker crumbs and melted butter. Spread out onto cookie sheet. Bake about 10 minutes or until golden. Cool. You can use fresh or frozen strawberries for the cheesecake filling. If using frozen, thaw before using. For the smoothest filling, make sure cream cheese has had a chance to soften at room temperature for at least 2 hours. If it’s too cold, it won’t take to the strawberry mixture.